It takes more than just musicians to keep a successful orchestra running smoothly. Behind every great arts organisation is a team of dedicated administrators, and the AYO Orchestral Management program gives a glimpse into the many supportive roles that exist in the orchestral world, and provides participants with the hands-on experience they need to excel in the field. As an orchestral management participant you’ll learn the essentials of stage management, foresight and planning, and put your new skills to the test as you manage an exciting two-week concert series by the range of ensembles at AYO National Music Camp. Each day at camp brings a new hands-on challenge, and your tutor, Angela Chilcott, will be with you every step of the way to ensure that you master the essentials of orchestral management. Angela has a wealth of experience in arts administration, and is Head of Orchestra Management at the Australian Ballet. From the minute you arrive at AYO National Music Camp, you’ll experience a whirlwind of new faces, exhilarating challenges. uplifting performances and first encounters with Australia’s best young musicians, composers, sound engineers and music journalists. With an action-packed schedule it’s important to look after our participants. We provide airport transfers, comfortable shared accommodation and three meals per day for every camp attendee. 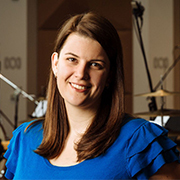 Angela is currently Head of Orchestra Management at Orchestra Victoria, overseeing orchestral administration for a varied performance calendar of opera, ballet, chamber music and regional programs. Read more.